Fried Chickpeas are a more nutritious snack than potato chips or many other fried snacks. Chickpeas are healthier and tasty too. You can use chickpeas in many recipes but this is one of the easiest. If you love chickpeas and How to cook chickpeas in a different way? is your question, you may find this helpful. If you are using the dry chickpeas, you will need to soak and pre cook your chickpeas. For step by stem instructions to soak dry chickpeas and cook them, go to How to cook chickpeas first. If you have precooked chickpeas in your fridge or you are using canned chickpeas, you are ready to start the next steps. Vegetable oil - 1 cup for frying. 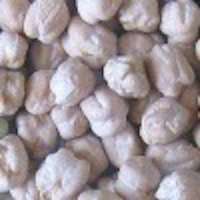 Soak and cook chickpeas if you are using dry chickpeas. Follow the instructions given on How to cook chickpeas. Spread drained chickpeas on a cloth for drying for an hour or so and then use as given below. Heat oil in a pan. Reduce heat. Add 1/2 cup drained chickpeas. Fry on low flame till just done. For about 4-5 minutes. Fry the remaining chickpeas in the same way. Sprinkle salt and spice powders and mix well. Fried chickpeas are ready to eat. Serve hot or cold. You can store and use these fried chickpeas for more than a week. Fried chickpeas are good to eat at a snack or as a side dish for any meal.Generally it gets eaten fast. Add lime juice and cilantro just before serving. Mix well. You may also add finely chopped onions, chaat masala just before serving. Cabbage Fry - A cabbage and chickpea dish.